Zoe and I moved back to the UK in 2015 having spent 6 years in Asia. We are both early 40s and have two children Oliver (6) and Chloe (4). Zoe is a Partner in a law firm, and David a Management Consultant, focusing on large infrastructure and real estate projects. David is also a Non-Exec Director of a local Social Housing Association. 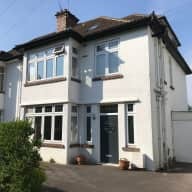 We live in Bristol, and due to embark on a house refurbishment, so looking for options to stay elsewhere (in or near Bristol) as a family during these works. We are all animal overs. Zoe in particular has grown-up on a small-holding in Worcestershire, where her Mum and Dad have been training dogs for the blind for many years. Quite simply, we are about to embark on a significant house refurbishment, so considering living elsewhere during the works. Ideally the house would be in or around Bristol. David is a Chartered Civil Engineer and worked in the real estate and infrastructure for over 20 years. He is pretty handy at DIY and certainly have the contacts to repair anything should it be required (mainly through my Non-Exec position on a social housing association). We own our house in Bristol along with a buy-to-let in Birmingham where David is also a Director of the Residents Association. Animal wise, we don't have any pets of our own, but aim to do so when the kids are a little older and can undertake walking duties by themselves. However, during the summer holidays our Aupair will be able to do this with the Children if and when David and Zoe are at work. It was a complete pleasure to have David and Zoe and their lovely children housesit for us. In the lead up to the sit it was easy to communicate with David and Zoe and we were even able to have a practise dog walk with the children. They were extremely accommodating in terms of working around our holiday plans and took the time to understand our pets and their requirements. We came back to a thoughtful welcome home array of milk, tea and biscuits, a spotless house and very happy pets. What more could you ask of a house-sit. I would definitely recommend David and Zoe. David, Zoe, Oliver and Chloe moved into their house just over three years ago from Singapore. We are neighbours at the opposite end of the terrace of three, just off the Downs in Bristol. Since moving in we have got to know the family and get together for suppers and BBQs. We help each other out as any good neighbours do and keep an eye on each others properties when away. The children are delightful and have always been well behaved when they come over to our house. We wouldn't hesitate to recommend the Stollards as house-sitters.